Figure 1.111. 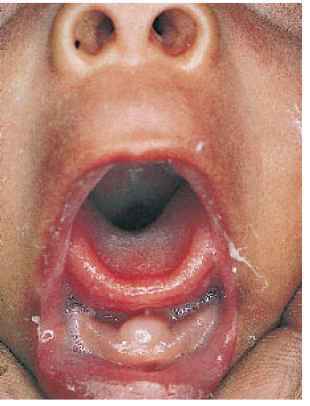 This infant presented with moderate respiratory distress and was noted to have a large cyst, especially on the left side at the base of the tongue. The cyst which was removed was diagnosed as an epithelial cyst in that it was lined by squamous epithelial cells. Figure 1.112. The large cystic midline swelling of the tongue in this infant was histologically diagnosed as a large thy-roglossal cyst which was benign and lined by columnar epithelial cells. Figure 1.114. This infant at birth presented with a tumor involving the midmandible and floor of the mouth. The mass divided the tongue which was thickened and foreshortened. There was an associated mid-facial cleft with a dermoid of the upper palate. With this type of defect a median cleft should be excluded. Tests for this were normal. Figure 1.115. A mass involving the tongue was noted at birth in this term infant. 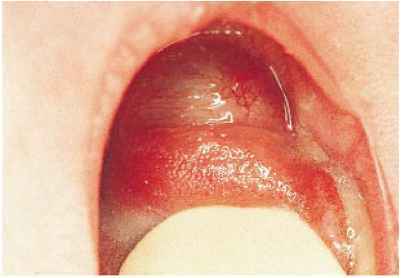 Upon surgical removal, the diagnosis of teratoma of the tongue was confirmed. This was a benign teratoma and the infant did well. Figure 1.116. 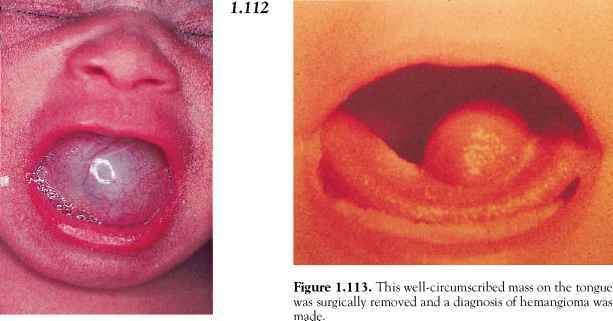 The large mass in the posterior mouth and nasopharynx in this term infant, with a cleft palate, was friable and bled easily. At surgery it was found to be a benign teratoma of the nasopharynx. Figure 1.117. Cleft lip may be unilateral or bilateral and is often associated with a cleft palate. This normal infant has a mild unilateral cleft lip with a normal palate. The nose is flattened on the affected side. Cleft lips and palates may be seen in otherwise normal infants or in infants with syndromes or chromosomal abnormalities. Figure 1.118. An example of a unilateral cleft lip with a normal palate in an infant with the popliteal pterygium syndrome. Note that the upper lip is indented to the left of the philtrum and the nose is flattened, but the defect does not extend into the alveolar process. Figure 1.119. A mild bilateral cleft lip in an otherwise normal infant. In partial or complete unilateral or bilateral cleft lip, the line of clefting is paramedian and follows the ridge at either side of the philtrum. Figure 1.120. 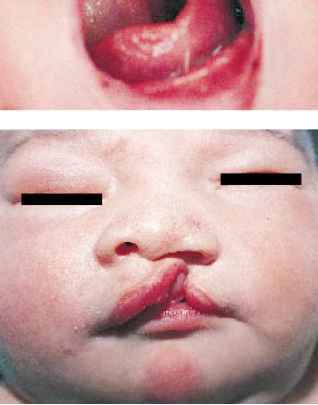 A unilateral cleft lip and cleft palate in an otherwise normal infant. The unilateral cleft lip has extended to the nostril, which is flattened and deflected. Cleft lip and palate occur in many syndromes such as trisomy 13 and the ectro-dactyly-ectodermal dysplasia-cleft-ing syndrome (EEC syndrome).